By Appointment to the King (George V) is on the motion covers and the Royal Arms of the time. "Three repeat orders constitute the exhibit of the well-known Sanbach factory of Fodens, Ltd. In general design and constructional detail, there has been practically no alteration in these machines for some considerable time past. It is interesting to note, however, that on two of the exhibits a Moore auxiliary double-acting donkey pump has been fitted on the off side of the engine, the two examples being the five-tonner for Harrods and the three-tonner for Schweppes_ They are both fitted for different uses. Harrods wish to have some means of pumping water on to the van body in case of accidental fire, and as it was inconvenient to do this with the ordinary engine-driven pump, and futile to rely upon any special adaptation of the injector for this purpose, the Moore pump was selected. Mr. Maidens, the engineer in charge of Schweppes's fleet, selected the Moore pump for an entirely different reason. Practically the whole of his wagons are employed on dock work, and often they are hemmed in by other vehicles for long periods at a time, and it is found that the injector is far too delicate an instrument on which to place entire reliance for maintenance of a safe water level in the boiler. 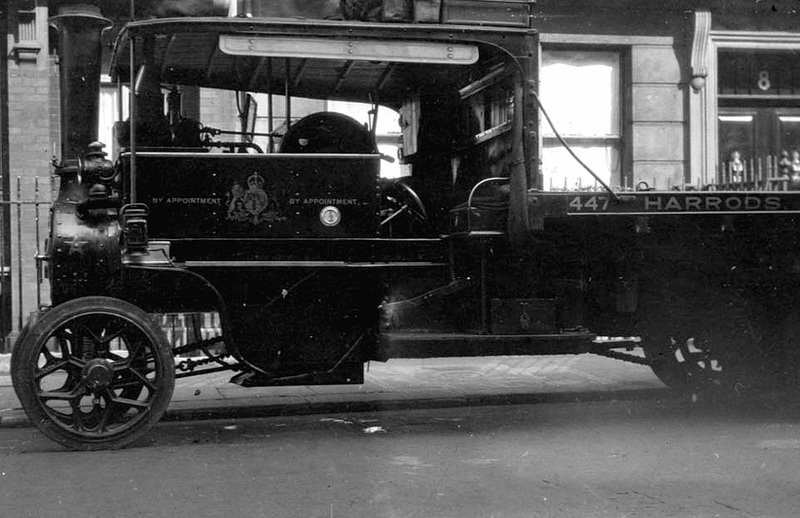 The engine-driven pump on the Foden wagon cannot be used when the wagon is standing, be cause the design furnishes power from a shaft that is in permanent connection with the road wheels. The donkey pump on Harrods van may also be used under similar conditions for feeding water into the boiler." If anyone has any more pictures of steamers owned by Foden I would be very interested to see them. This Harrods steam lorry is sat in the garage at the Harrods depot in Thatcham near Newbury. I was shocked to see the picture of this London Foden steam Lory. Probably, this is one of the oldest steams. You can resume2hire review for your personal resume writing. You would not believe me that I have already traveled in these steams in my childhood era and now I am enjoying my last days of life.